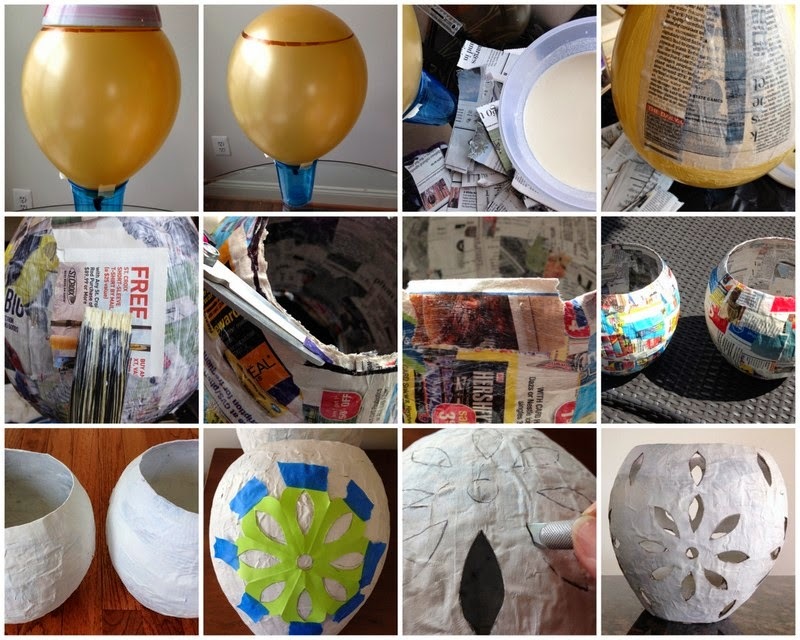 There are lots of cute solar lights and lanterns made out of all sorts of material for the summer, but have you thought about making one out of paper mache? 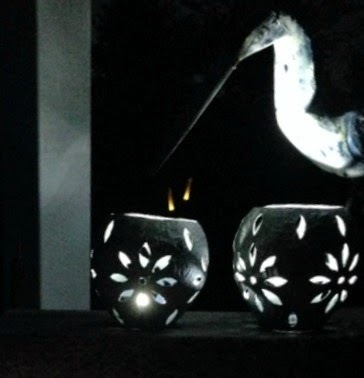 Nothing like your very own handcrafted paper mache lantern! So easy to make . . . although a bit time consuming. But the end results can be quite beautiful! And best of all, the lanterns work great as an everyday light source, party and home decorations, and most importantly, outdoor lanterns for the summertime. Step 2 Blow up balloon to desired lantern size. For the openings, use a small bowl as a template and place on the round bottom portion of balloon and draw around edge using a black marker. Do the same on the closed end with a smaller bowl. Next, attach a large plastic cup using masking tape to support the balloon and to hold while applying the strips. Step 3 Coat a small section at a time with glue and using a paint brush to pick up and attach the strips, brushing the glue on top of the paper(less messier than using your hands). *Lay all strips in the same direction for each layer, alternating direction or color of paper. Step 4 Glue on at least 5 or 6 layers between the black marked areas. Step 5 Once your last layer of paper strips is applied, coat the final layer with glue to seal (I used outdoor mod podge). Allow to dry completely. I let mine dry 3 days because of rainy weather. By the time the paper mache drys, the balloon probably has shrunk. Not to worry, the form keeps its' shape. Step 6 Pop the balloon and remove the remnants. Step 7 Trim the edges to make them even. Step 8 Overlap the edges of the openings with additional strips of paper and glue and let dry. Step 9 Paint the entire lantern with white primer and allow to dry. Step 10 Use a stencil or pattern that you created to make a decorative design for your lantern. I used a 5 petal flower pattern that I had folded and cut out. Step 11 Draw the pattern on heavy duty paper or cardboard and cut out using a xacto knife. Position on lantern with masking tape and trace. Carefully cut out pattern with an xacto knife. Seal the cutout edges with glue and let dry. Step 12 Spray with textured stone paint and follow directions for usage, sealing and dry time. Textured stone paint is amazing and gives an actual "stone" finish. 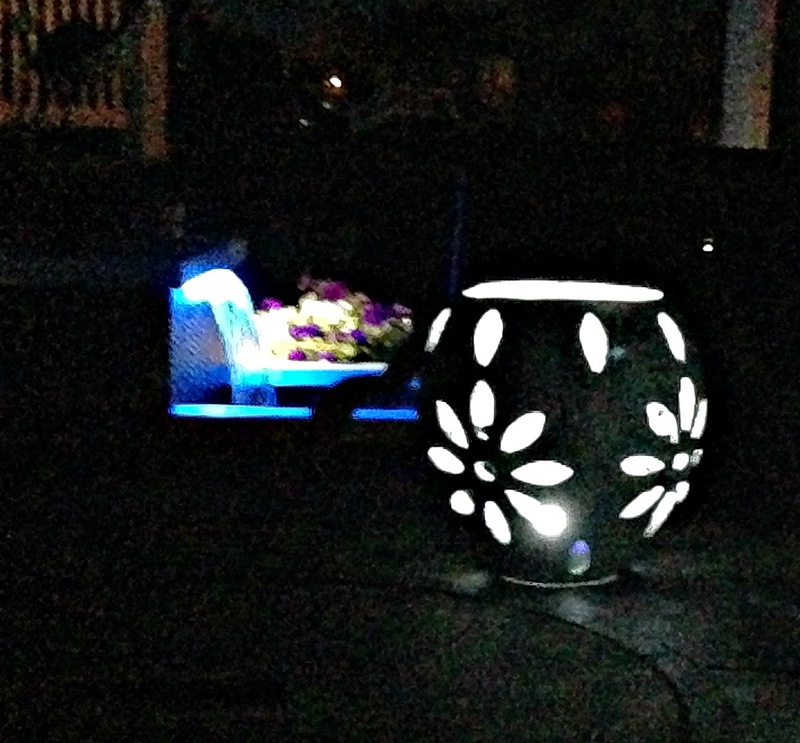 Place the top of solar lights (remove stick base) or led candle/lights into the base and . . .
light up that area or decorate! You always amaze me! These turned out excellent- you are so talented! These are very interesting. I'd love to try this. Thank you for sharing. That's so awesome, I've never thought of paper mâché for garden ideas what a great idea especially for our summer Christmas. Fabulous! Your bird looks like it's up to something. You light up my life with your clever crafts, Gail! (And I am surprised no one else made that comment!) I am late on the solar lights train - they seem to get cheaper and cheaper. what a great idea!!!!!! love it! So clever, they look great. I love the night time pics! Wow... I love these! 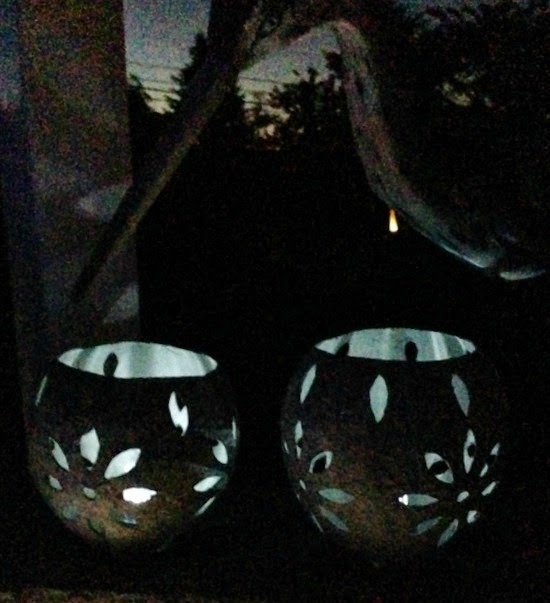 We have only solar lights outside, and I've never thought of making lanterns for them. What a fabulous idea! These are so clever and look fabulous, too! I never would have dreamed of doing this, you are amazing! Nope, I never would've thought of that. Great idea, and they turned out so cute! Hi Gail, these are pretty cool - liking this idea! They look so super in the garden, especially with the metallic paint. A brilliant idea. These are beautiful! Definitely well worth the time and effort put in to making them! These are great! Thanks for posting this week at the #WWDParty. Thank you so much for sharing this on our bowdabra saturday crafty showcase. I always look forward to your creations!! !